This week’s BEACON Researchers at Work blog post is by MSU postdoc Gaurav Moghe. odel organisms, of which a vast majority are still largely unstudied. Almost 2.5 years later, I find myself as a postdoc in the thick of this very exact research, working on understanding how the massive diversity in specialized metabolism (or secondary metabolism as is popularly known) arises in the plant world. How did I end up doing this research? While I was working towards my PhD, I also created a wiki website called Biodiversity of India on the side, which documents various aspects of Indian biodiversity. I’m originally from India, where I was brought up with various Hindu religious customs, traditions and folk medicines that had significant associations with the local flora and fauna. I was interested in documenting such cultural associations of biodiversity, in hopes of not only aiding biodiversity conservation efforts but also organizing the information to make it more accessible for research. While working on this site, I became interested in plant specialized metabolism, which constitutes the basis for several of our spices, folk medicines, perfumes, cosmetics and pest control agents. 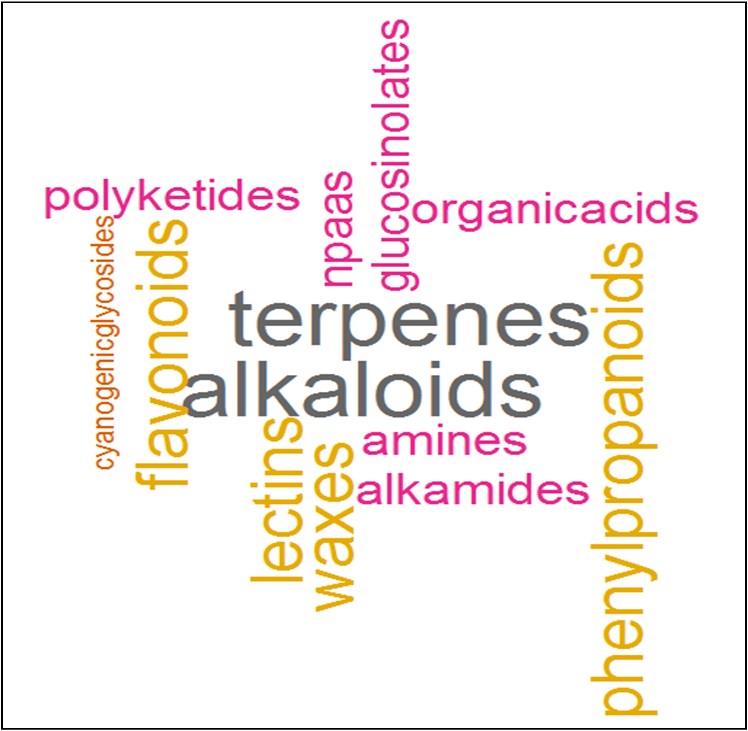 Word cloud of different types of plant specialized metabolites. Size of words is scaled by the log10 of the approx. number of known compounds (Wink, 2010). 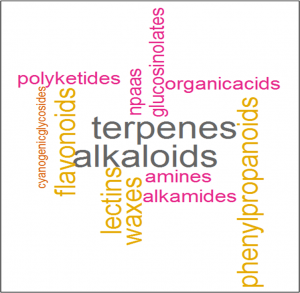 There are >200,000 specialized metabolites known in the plant world, and they come in various different shapes and forms. These compounds are produced by plants for interacting with the living world around them – their pollinators, microbial communities, herbivores and other plants around them. Thus, specialized metabolites constitute a highly diverse “language of the plant world”. However, the various evolutionary mechanisms that generate the observed natural variation in this language are not well-documented. Imagine a world where we KNOW the language of plants! Not only will that give us a profound appreciation of the innovations in the living world, it will also provide us an opportunity to harness those innovations for societal uses such as in agriculture or medicine. I joined Rob Last’s lab here at MSU to work on the evolution of specialized metabolic pathways in the plant world, specifically on a class of compounds called acylsugars, in tomato and related species in the nightshade (Solanaceae) family. These sticky compounds are produced by hairy tissues called trichomes on the surface of leaves and stems, and they are important for insect defense. Acylsugars were known to be present only in some Solanaceae species, but no one had yet conducted a broad analysis of acylsugar phenotypic variation in Solanaceae. In addition, I was interested in understanding how the biosynthetic pathway was put together – did it exist when the family arose? When did the enzymes arise? What did they emerge from? How have the enzymes evolved since their emergence? The process of addressing these questions would also unravel diverse biosynthetic enzymes that may be used in a “toolkit” for acylsugar production in cultivated tomato, thus boosting its natural defense against pests. To address these questions, I performed high-throughput mass spectrometric analysis of over 40 Solanaceae species, catalogued the extensive acylsugar phenotypic variation (>200 different acylsugars documented) and selected four species with very interesting phenotypes. Then, I performed RNA-seq from the trichome and non-trichome tissues of these non-model species and identified candidate genes using differential expression and orthology. Finally, using a combination of in vitro enzyme assays and in vivo gene knockdown strategies, I was able to confirm some of the enzymatic activities that produce the observed phenotypes in different Solanaceous species. Homology model of an acylsugar biosynthetic enzyme, with positions of the two substrates modeled into its active sites. Rapid evolution in the binding pockets may lead to rapid divergence in enzyme activities. 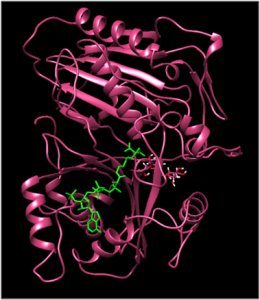 My results indicate that the acylsugar biosynthetic enzymes – that belong to an enzyme family known as the BAHD family – may have emerged from alkaloid biosynthetic members of the same family, and the activities may have existed close to the emergence of the Solanaceae. My findings also suggest that these enzymes are highly evolvable and rapidly change their substrate and donor specificities, and that frequent duplications and subsequent functional divergence may have led to the observed diversity of acylsugars we see in the Solanaceae family today. Several questions still remain unanswered. For instance, what causes the rapid divergence of activities? Are the diverse acylsugar phenotypes functionally important, or is a higher order trait such as “stickiness” more important? Are the enzyme activities evolving via drift, or are certain lineages under selection? Are the BAHD enzymes under selection to be more evolvable? The original question – what did these enzymes evolve from? – also remains unanswered. My future research is aimed at addressing some of these questions. Overall, I feel that my PhD and postdoctoral research have given me a strong foothold in using biodiversity-driven, experimental as well as computational approaches to understand plant physiology. This strategy is enabled by the rapid development in omics and phenotyping technologies. In the future, I hope to create platforms where we can conduct such research in non-model plants and enable rapid discovery of evolutionary processes in the plant world. For more information about Gaurav’s work, you can contact him at moghegau at msu dot edu. This entry was posted in BEACON Researchers at Work and tagged BEACON Researchers at Work, biodiversity, genomics, metabolic pathways, plant biology. Bookmark the permalink.